In a week which has seen some of the highest avalanche risks of the winter in the Highlands, one avalanche survivor told his story to BBC Scotland. "I heard a noise like a train. I thought that sounds like an avalanche. And then it happened." Kyle Wood, from Nottingham, was climbing on Aonach Mor near Ben Nevis on Saturday. He was with two friends, Karl Halliday and Nick Ward. They had been at a meet with about 30 members of the UKClimbing web forum, staying near Roybridge north of Fort William. The weather, and avalanche, forecasts had been dreadful - too dangerous to venture out, he says. But finally it looked like a decent day. "The wind had been scouring western slopes and dumping snow on east facing slopes, so we knew there was a high risk of avalanches there", the 29-year-old explains. So the group planned a route which should have been safe. They set off to climb Western Rib. "But as the day got on we hadn't reached the top, and the weather was deteriorating." "So we abseilled into an adjacent gully, and climbed down around 200m until we got to some flattish ground." "We stopped to sort out some kit, get the head-torches out because it was getting dark, and find the sandwiches." But while they were rummaging in Kyle's ruck-sack, they were hit by an avalanche. "I felt a push of snow from behind me. So I put my hands back to brace myself." "But it kept on coming. And then everything I was sitting on started to move." "We ended up cart-wheeling over each other, turning upside down." All three men had been carrying a pair of ice axes, which they put down on the snow when they stopped. Avalanche training teaches people to swim through the snow, to try to stay upright, and remain as close to the surface as possible. And Kyle said he ended up doing a "ridiculous comedy breast stroke" through the snow as he was engulfed. The three men came to rest "for a second" - then they were hit by a second avalanche. "I was focussing completely on staying alive. It never even crossed my mind that I might be about to die." "But when it finally stopped, we were all above the snow with our heads and arms clear." "We shouted to each other, to make sure everyone was alright. We had to dig ourselves out." "Then there was a real sense of we could have just died." But the group soon realised they had lost their only map - and compass. They had been in Kyle's rucksack, which had been swept away by the snow. "So there we were on a mountain. In a storm. At night. With no map, and no compass." They realised they had to get down as quickly and safely as they could. "We were aware it was still a dangerous place, and there could be more avalanches." "We were on flat ground, but with heavily loaded snow slopes above us on both sides." "And there was snow a metre-deep lying everywhere. So to move at all you were digging a trench." "We were absolutely shattered, disorientated, and scared." Kyle admits there were times he almost wanted to give up. "It's a cliche, about just wanting to lie down and go to sleep. But we kept each other going," he says. "If it wasn't for the other two guys, I wouldn't have made it." "We were in a situation that was spiralling, and could get worse. But with real team work, we pulled it together and got ourselves out of it." "That's the spirit of team work - and of mountaineering." Just before the avalanche they had texted friends to say they were heading for home. As they walked down, they got an intermittent signal on one mobile phone. "But we didn't want to say we'd been in an avalanche. So we told them we'd had one or two issues on the descent, which were delaying us," says Kyle. At about 0100 GMT, the group found a marker post on a forest road, which told them they were 2km from the Nevis Range car park. "It was the most incredible thing to see. Because we could have been just walking round in circles." Then they started to hear car horns from a group of friends who'd come out to find them after getting the text messages. "They'd been waiting for us. They'd been there about four hours." "They'd got towels, and a change of clothes for us." "That was a real emotional moment." Looking back, Kyle insists he and his friends had been sensible, and checked the forecasts before venturing out. They were all reasonably experienced at winter climbing, he says, and they were well equipped. But he concedes they didn't fully appreciate how bad things were getting when the weather changed. And, he says, there are lessons to be learned about how to distribute and carry equipment. He says he plans to get more winter training, and some formal avalanche training. 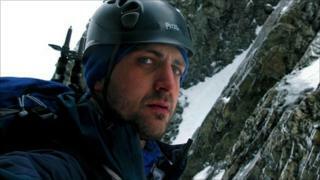 But he told the BBC the experience would "never" put him off going climbing again. "It'll make me a lot more safety conscious. But I'm still going to go out and enjoy the hills," he says.